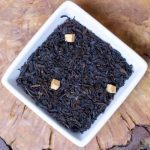 Light caramel notes grace this lovely black tea. The pleasure starts before you even steep it with the buttery, caramel aroma and then, oh, the taste! You will love this. 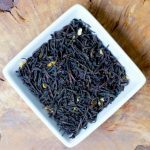 Mmmm…this is a well crafted flavored black tea for those mornings you just need something extra special! 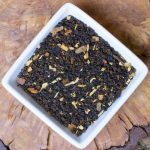 Chocolate and caramel come together to create a smooth, wonderful cup of black tea. Cinnamon Spice is an intense cinnamon(ey) experience if ever there was one. The sweetness in the this tea comes from cinnamon oil and it really hits the spot when you are craving a sweet treat. I also have a non-caffeinated version in the Rooibos category. A slightly more exotic black tea that is great for blending with other flavors and botanicals. 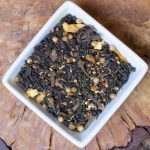 There are so many flavor combinations to create with this richly flavored black. For those who like their Chai a little exotic, this black tea has ginger root, cinnamon, shredded coconut, with ginger, coconut and vanilla flavor. A classic scented Chinese tea, also known as Meigui Hongcha. Rose petals and tea leaves are layered during the production process until the scent, flavor and quality desired is achieved. It is sweet and full of flowery taste. 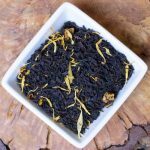 This truly is a “divine” lemon black tea–that will please everyone, even those who don’t think they like black tea. It is full of fresh lemon flavor, but is not tart or sour in any way. I love it cold steeped and hot, but any way you make it will be delightful! 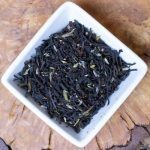 This is a unique twist on Earl Gray with a subtle smoky character that adds dimension. Even people who may not regularly drink Earl Gray like this tea because of the savory exotic experience it provides. 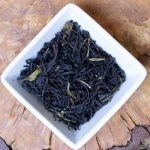 This is a favorite of those who like Earl Gray, but a little lighter. This is a good quality Ceylon tea with oil of bergamot plus a fragrant lavender. 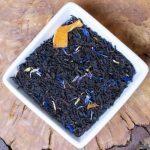 This is an Earl Gray Crème that combines the classic flavor of traditional Earl Gray with a creamy vanilla tone that softens and expands its wonderful character. I’ve renamed the familiar Earl Gray Moonlight to Earl Gray Mosaic–still the same yummy tea! The best Earl Gray you will ever taste! Fine Indian teas with a large portion of white tips blended with the finest oil of bergamot available. I can’t say enough about how much I love this chai blend and I guess it shows by calling it our House Chai. This is a slightly different version of Masala Chai with more clove character. It is a big favorite among chai lovers! I have so much fun telling the kids that chai means tea and then asking them what people are saying when they ask for “chai tea”. You can guess the response: uproarious laughter. 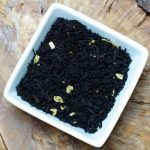 This is a unique masala chai that is delicious on its own or steeped traditionally with milk and sugar. Whole spices–cinnamon, ginger, cloves, fennel seed and orange peel, plus a subtle hint of smoke make this tea a treat to savor. You’ll appreciate the aroma as well as the taste.